More than half (55%) of the U.S. Hispanic population resides in three states: California, Texas, and Florida. 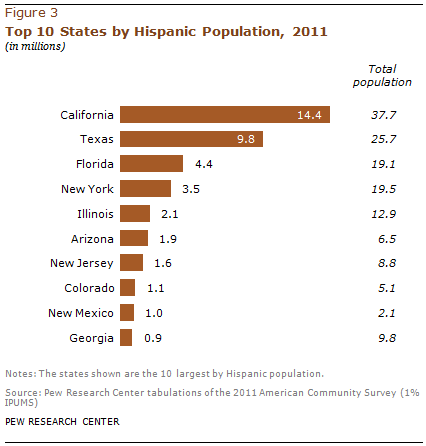 California has the nation’s largest Hispanic population, with about 14.4 million Hispanics. California’s Hispanic population alone accounts for more than one-fourth (28%) of U.S. Hispanics. In New Mexico, Hispanics make up 46.7% of the state’s population, the highest Hispanic population share among the 50 states and District of Columbia. Maine, West Virginia, and Vermont were among those with the lowest Hispanic population shares, at 1% each. Over the last decade, some of the fastest growing Latino populations are in the southeastern U.S.
States that have experienced the largest percentage increases in their Latino populations all have Latino populations of less than 1 million. As a group, the 10 states with the fastest growing Hispanic populations together accounted for 11% of the growth in the nation’s Hispanic population between 2000 and 2011. By contrast, the 10 most populous Hispanic states together accounted for 69% of the growth in the nation’s Hispanic population during the same period. 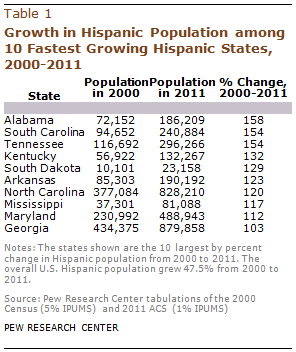 Alabama’s Hispanic population grew 158% between 2000 and 2011, more than any other state. Among all states and the District of Columbia, New York had the smallest Hispanic population percentage growth with an increase of 22% between 2000 and 2011. 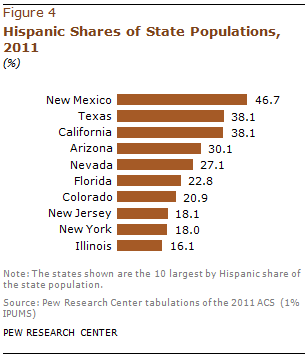 No state experienced a decline in its Hispanic population during the period. 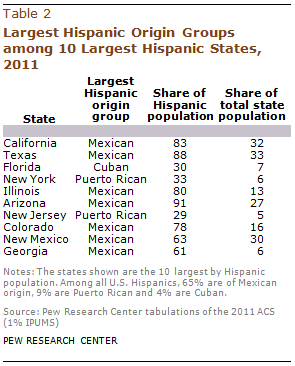 Mexicans are the largest Hispanic origin group in seven of the top 10 largest states by Hispanic population. The exceptions are New York, where Puerto Ricans are the largest Hispanic group, making up 33% of the state’s Hispanic population; New Jersey, where Puerto Ricans are the largest Hispanic origin group and make up 29% of New Jersey’s Hispanic population; and Florida where Cubans are the largest Hispanic origin group, accounting for three-in-ten (30%) Hispanics in the state. The diversity of Hispanic origin varies widely by state, where the dominant group accounts for 29% to 91% of the state’s Hispanic population (among the top 10 states by Hispanic population) and between 5% and 33% of a state’s total population. More than half (54%) of Hispanics in the District of Columbia are foreign born, a share greater than any of the 50 states. Among North Dakota’s Hispanics, 6% are foreign born, the lowest share among the 50 states and the District of Columbia. 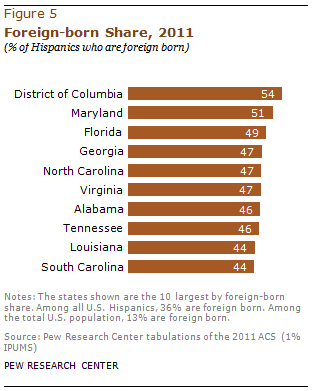 The ranking by foreign-born Hispanic population, though, tells a different story. California has more Hispanic immigrants—5.4 million—than any other state. Overall, they make up 37% of the state’s Hispanic population.